This is probably one more blog entry of mine that falls into the “obvious” category, but until I tried it today I didn’t know it was possible so hopefully I’m not the only one. 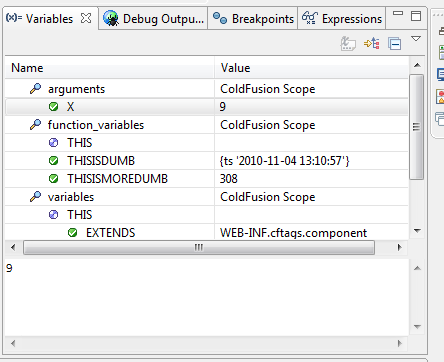 I don’t normally use the debugger in ColdFusion Builder. There isn’t anything wrong with it - it just doesn’t really mesh with the way I like to write code. On the flip side, I make a heck of a lot of use out of the debugger in Flash Builder. Why do I use it more there and less in ColdFusion? No idea. That being said, a reader this week asked me an interesting question. He is using Flash Builder and wanted to know about debugging on the server side. I knew you could debug the Flex side of course. You can also easily debug the network communications. What I wasn’t sure of was how I’d handle debugging on the ColdFusion Builder side when I’m actually using Flash Builder. The debuggers in both products aren’t related. (Well, I assume they share some code at the Eclipse level.) Here is what I found out. I began by creating a super simple CFC to act as my service. I put some bogus code in there just to give me a few lines of logic. Over in Flash Builder I then created an extremely simple front end. All this code does is take input from the first field and send it to my CFC. When the result is returned I place it in the second field. I hit run in Flash Builder and confirmed everything worked. I then went to ColdFusion Builder (I don't run my installs in the same Eclipse package) and switched to the ColdFusion Debugging perspective. I put a breakpoint on one of the lines and then I clicked the little green bug to start up the debugging session. This launched double.cfc in the browser which gave me the normal CFC view. Now at this point I then switched back to my browser tab containing my Flex app. I entered another number, hit the button, and voila - all of a sudden CFBuilder is blinking in my task bar. I could see nothing being displayed in the Flex app and when I alt-tabed over to CFBuilder I was in the middle of a debugging session. When I let the method carry on, my data was returned to Flex. I tried the same thing in a simple Ajax based application and it also worked. Even better - I then switched over to Aptana and converted my jQuery example into a simple AIR application. I ran it and once again - the result was 'hung' up while I debugged in ColdFusion Builder. Cool! So - as I said, I guess this is 100% expected, but it never occurred to me to try using CFBuilder's debugger like this. I can actually see myself using it more now.